Tyrosine-protein kinase receptor UFO is an enzyme that in humans is encoded by the AXL gene. The gene was initially designated as UFO, in allusion to the unidentified function of this protein. The AXL protein is a cell surface receptor. 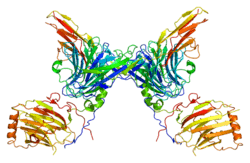 The protein encoded by this gene is a member of the receptor tyrosine kinase subfamily. Although it is similar to other receptor tyrosine kinases, the Axl protein represents a unique structure of the extracellular region that juxtaposes IgL and FNIII repeats. It transduces signals from the extracellular matrix into the cytoplasm by binding growth factors like vitamin K-dependent protein growth-arrest-specific gene 6 (GAS6). It is involved in the stimulation of cell proliferation. This receptor can also mediate cell aggregation by homophilic binding. The Axl gene is evolutionarily conserved between vertebrate species. This gene has two different alternatively spliced transcript variants. Axl is a chronic myelogenous leukemia-associated oncogene and also associated with colon cancer and melanoma. It is in close vicinity to the BCL3 oncogene, which is at 19q13.1-q13.2. AXL may play an important role in Zika virus infection, allowing for entry of the virus into host cells. There is ongoing research to develop possible drugs to target this signalling pathway and treat cancers. In 2014 those in clinical trials included::Table 2 LY2801653, MP-470 (Amuvatinib), SKI-606 (Bosutinib), MGCD 265, ASP2215, XL184 (Cabozantinib), GSK1363089/XL880 (Foretinib), SGI-7079, and R428 (BGB324). eg. ASTELLAS is currently testing ASP2215 (Gilteritinib), a dual FLT3-AXL tyrosine kinase inhibitor in acute myeloid leukemia (AML). BGB324 (a selective AXL inhibitor) is in clinical trials for AML and non-small cell lung cancer (NSCLC). AXL receptor tyrosine kinase has been shown to interact with TENC1. Axl is an essential epithelial-to-mesenchymal transition-induced regulator of breast cancer metastasis and patient survival. ↑ O'Bryan JP, Frye RA, Cogswell PC, Neubauer A, Kitch B, Prokop C, Espinosa R, Le Beau MM, Earp HS, Liu ET (Oct 1991). "axl, a transforming gene isolated from primary human myeloid leukemia cells, encodes a novel receptor tyrosine kinase". Molecular and Cellular Biology. 11 (10): 5016–31. PMC 361494 . PMID 1656220. 1 2 3 "Entrez Gene: AXL AXL receptor tyrosine kinase". ↑ Janssen JW, Schulz AS, Steenvoorden AC, Schmidberger M, Strehl S, Ambros PF, Bartram CR (1991). "A novel putative tyrosine kinase receptor with oncogenic potential". Oncogene. 6 (11): 2113–20. PMID 1834974. 1 2 3 4 Wu X, Liu X, Koul S, Lee CY, Zhang Z, Halmos B (2014). "AXL kinase as a novel target for cancer therapy". Oncotarget. 5 (20): 9546–63. doi:10.18632/oncotarget.2542. PMC 4259419 . PMID 25337673. ↑ Nowakowski TJ, Pollen AA, Di Lullo E, Sandoval-Espinosa C, Bershteyn M, Kriegstein AR (2016). "Expression Analysis Highlights AXL as a Candidate Zika Virus Entry Receptor in Neural Stem Cells". Cell Stem Cell. 18 (5): 591–596. doi:10.1016/j.stem.2016.03.012. ISSN 1934-5909. ↑ Hafizi S, Alindri F, Karlsson R, Dahlbäck B (Dec 2002). "Interaction of Axl receptor tyrosine kinase with C1-TEN, a novel C1 domain-containing protein with homology to tensin". Biochemical and Biophysical Research Communications. 299 (5): 793–800. doi:10.1016/S0006-291X(02)02718-3. PMID 12470648. ↑ Vajkoczy P, Knyazev P, Kunkel A, Capelle HH, Behrndt S, von Tengg-Kobligk H, Kiessling F, Eichelsbacher U, Essig M, Read TA, Erber R, Ullrich A (Apr 2006). "Dominant-negative inhibition of the Axl receptor tyrosine kinase suppresses brain tumor cell growth and invasion and prolongs survival". Proceedings of the National Academy of Sciences of the United States of America. 103 (15): 5799–804. doi:10.1073/pnas.0510923103. PMC 1458653 . PMID 16585512. Neubauer A, Burchert A, Maiwald C, Gruss HJ, Serke S, Huhn D, Wittig B, Liu E (Mar 1997). "Recent progress on the role of Axl, a receptor tyrosine kinase, in malignant transformation of myeloid leukemias". Leukemia & Lymphoma. 25 (1-2): 91–6. doi:10.3109/10428199709042499. PMID 9130617. Bergsagel PL, Victor-Kobrin C, Timblin CR, Trepel J, Kuehl WM (Jan 1992). "A murine cDNA encodes a pan-epithelial glycoprotein that is also expressed on plasma cells". Journal of Immunology. 148 (2): 590–6. PMID 1729376. Partanen J, Mäkelä TP, Alitalo R, Lehväslaiho H, Alitalo K (Nov 1990). "Putative tyrosine kinases expressed in K-562 human leukemia cells". Proceedings of the National Academy of Sciences of the United States of America. 87 (22): 8913–7. doi:10.1073/pnas.87.22.8913. PMC 55070 . PMID 2247464. Neubauer A, Fiebeler A, Graham DK, O'Bryan JP, Schmidt CA, Barckow P, Serke S, Siegert W, Snodgrass HR, Huhn D (Sep 1994). "Expression of axl, a transforming receptor tyrosine kinase, in normal and malignant hematopoiesis". Blood. 84 (6): 1931–41. PMID 7521695. O'Bryan JP, Fridell YW, Koski R, Varnum B, Liu ET (Jan 1995). "The transforming receptor tyrosine kinase, Axl, is post-translationally regulated by proteolytic cleavage". The Journal of Biological Chemistry. 270 (2): 551–7. doi:10.1074/jbc.270.2.551. PMID 7822279. Lee ST, Strunk KM, Spritz RA (Dec 1993). "A survey of protein tyrosine kinase mRNAs expressed in normal human melanocytes". Oncogene. 8 (12): 3403–10. PMID 8247543. Schulz AS, Schleithoff L, Faust M, Bartram CR, Janssen JW (Feb 1993). "The genomic structure of the human UFO receptor". Oncogene. 8 (2): 509–13. PMID 8381225. O'Bryan JP, Songyang Z, Cantley L, Der CJ, Pawson T (Apr 1996). "A mammalian adaptor protein with conserved Src homology 2 and phosphotyrosine-binding domains is related to Shc and is specifically expressed in the brain". Proceedings of the National Academy of Sciences of the United States of America. 93 (7): 2729–34. doi:10.1073/pnas.93.7.2729. PMC 39699 . PMID 8610109. Mark MR, Chen J, Hammonds RG, Sadick M, Godowsk PJ (Apr 1996). "Characterization of Gas6, a member of the superfamily of G domain-containing proteins, as a ligand for Rse and Axl". The Journal of Biological Chemistry. 271 (16): 9785–9. doi:10.1074/jbc.271.16.9785. PMID 8621659. Braunger J, Schleithoff L, Schulz AS, Kessler H, Lammers R, Ullrich A, Bartram CR, Janssen JW (Jun 1997). "Intracellular signaling of the Ufo/Axl receptor tyrosine kinase is mediated mainly by a multi-substrate docking-site". Oncogene. 14 (22): 2619–31. doi:10.1038/sj.onc.1201123. PMID 9178760. Yanagita M, Arai H, Ishii K, Nakano T, Ohashi K, Mizuno K, Varnum B, Fukatsu A, Doi T, Kita T (Apr 2001). "Gas6 regulates mesangial cell proliferation through Axl in experimental glomerulonephritis". The American Journal of Pathology. 158 (4): 1423–32. doi:10.1016/S0002-9440(10)64093-X. PMC 1891897 . PMID 11290560. Sun WS, Misao R, Iwagaki S, Fujimoto J, Tamaya T (Jun 2002). "Coexpression of growth arrest-specific gene 6 and receptor tyrosine kinases, Axl and Sky, in human uterine endometrium and ovarian endometriosis". Molecular Human Reproduction. 8 (6): 552–8. doi:10.1093/molehr/8.6.552. PMID 12029073. D'Arcangelo D, Gaetano C, Capogrossi MC (Oct 2002). "Acidification prevents endothelial cell apoptosis by Axl activation". Circulation Research. 91 (7): e4–12. doi:10.1161/01.RES.0000036753.50601.E9. PMID 12364394. Hafizi S, Alindri F, Karlsson R, Dahlbäck B (Dec 2002). "Interaction of Axl receptor tyrosine kinase with C1-TEN, a novel C1 domain-containing protein with homology to tensin". Biochemical and Biophysical Research Communications. 299 (5): 793–800. doi:10.1016/S0006-291X(02)02718-3. PMID 12470648. Ito M, Nakashima M, Nakayama T, Ohtsuru A, Nagayama Y, Takamura N, Demedchik EP, Sekine I, Yamashita S (Nov 2002). "Expression of receptor-type tyrosine kinase, Axl, and its ligand, Gas6, in pediatric thyroid carcinomas around chernobyl". Thyroid. 12 (11): 971–5. doi:10.1089/105072502320908303. PMID 12490074.